* Which is, in case you were wondering: Make these. These dark, crazy moist muffins will keep well for several days, and the brown sugar on top, should you not skimp on it like I did, adds a crunchy touch, perfect for those of you who know that the lid is the best part. Preheat the oven to 450°F. Grease and flour 18 muffin cups and set aside. 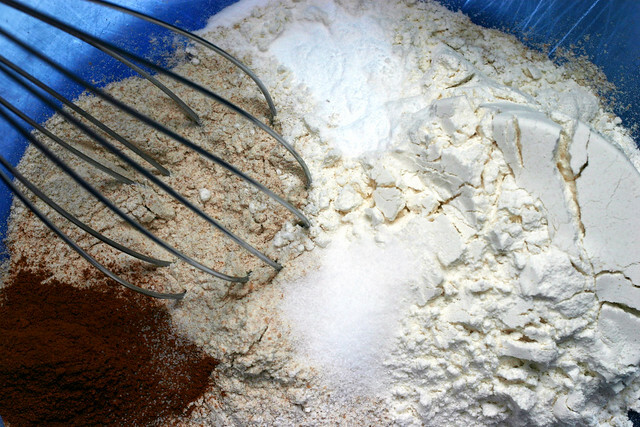 Mix together the flours, baking powder, baking soda, salt, and cinnamon, and set aside. In a separate bowl, cream the butter and add the granulated sugar and 1/4 cup of the brown sugar. Beat until fluffy. Add the egg and mix well; stop once to scrape the sides and bottom of the bowl.Mix in the buttermilk gently. (If you over-mix, the buttermilk will cause the mixture to curdle.) Stir in the dry ingredients and fold in the apple chunks. Divide the batter evenly among the prepared muffin cups, sprinkling the remaining 1/4 cup brown sugar on top. Bake for 10 minutes, turn the heat down to 400°F, and bake for an additional 5 to 10 minutes, or until a toothpick inserted into the center of a muffin comes out clean. Cool the muffins for 5 minutes in the tin, then turn them out onto a wire rack to cool completely. Like this post? Subscribe for more! New here? You might want to check out the comment guidelines before chiming in. i am making these RIGHT NOW! Well, as soon as my butter gets to room temperature, that is. Yum! I think I’ know what’s cooking for my weekend treats. Thank you for adding the note about the sugar on top. I would’ve skimped on it! Ohh goodness how I love apple muffins. I made a batch a few weeks ago (it’s on my blog if you want to see pics) and promptly made another batch two days later… They are so good. Especially warm, with melted butter/margarine… Yummmmmmmmmmm. These look SPECTACULAR…holy wow, I’m drooling. I recently had apple muffins made with millet flour and they were delicious. Do you think I could substitue some of the whole wheat flour with millet flour? The pictures look scrumptious. Oh My God! Those look really appley! yum! There’s just something about good bites of things inside that makes them extra special. AND I AM EXCITED ABOUT IT, OK? In all seriousness, this looks good, I’m always interested in whole wheat food that’s actually as good as non-whole wheat. I’m not exactly a health nut. Excellent looking muffins. I love brown sugar in or on baked goods. It always gets melted and all gooey, there is nothing like it. I usually bake bananas or blueberries into my muffins, I’ll have to try it with apples. I bet you could use all whole wheat pastry flour in this recipe, or maybe add some oats. Speaking of sweet, per your suggestion, I headed over to City Bakery today and hit up some of those peanut butter cookies. I glutonously went for the hot chocolate too. Little did I realize what I was getting myself into. It was so glorious that I left half at the office as a pick me up during my Monday blues. Photos taken and drooled over. Hmmm … wonder how’d they be with a little booze baked in? These look AMAZING. I am going to try them this weekend if I have the time. There is nothing like a good, moist muffin….. I made these dairy-free and they are phenomenal! Subbed 1/4 c applesauce and 1/4 oil for the butter and used vanilla almond milk for the yogurt. hmm… I think streusel, or prehaps turbinado, on top will be even better. Nice pic (sixth down). woah. awesome pictures. you know what? i think the saying “a picture is worth a thousand words” has finally come true for me. These look so healthy and breakfasty, I would nearly convince myself they are heathy and not a muffin!!!! Beautiful muffins! They look just perfect for April weather! Off to the market to buy the ingredients for these muffins. Oh yum they look so delish! The words ‘make these’ are enough. Really. They look perfect. yumm….i just threw out some apples that weren’t great for eating anymore but would have been perfect for baking! shoot! oh well, I’ll probably bake them anyway because they look some delicious and I like the brown sugar topping idea, I’ll just need to take a trip to the grocery store. Hmmm, I’m going to try these! 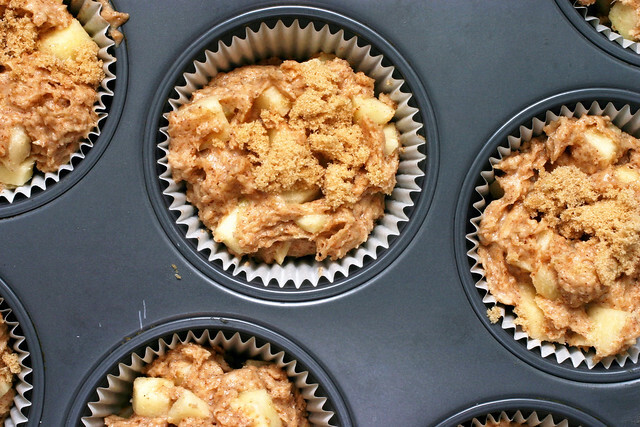 Hope the weekend is relaxing for you, and that you enjoy some of those scrumptious-looking whole-wheat-apple muffins!! Whoa. I don’t typically like apple stuff, but those just look down right delicious! I just wanted to say how much I love your blog, your food all looks perfect, and your photography is phenomenal! 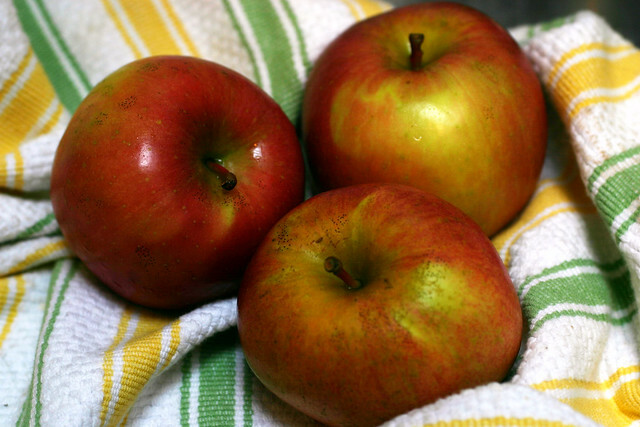 Perfect for the last of my apples and dark brown sugar – in the batter – light brown on top. The picture sold me and since I had all the ingredients they’re in the oven now. Nice recipe – and yes, I also had enough for 18 muffins in my medium pan. you are forgiven for skimping on words in favor of photos, especially when the pictures are this beautiful. I can just imagine the warm cozy smell of warm apples baking in the oven, one of my scents! I just got the ingredients to make the lemon blueberry yogurt cake, but this recipe is next! OH! and I found meyer lemons in TEXAS! You know you’re a foodie when you do the happy dance in the produce aisle and you don’t care who is watching. Ooh. I made some whole wheat apple (& raisin) muffins not that long ago! Of course, I also make everything whole wheat, so I guess that’s not so surprising. :) I also would probably skimp on the brown sugar, so thanks for the advice! What kind of apples did you use out of curiosity? I’ve never baked with apples before. Okay, the muffins look delicious but why do the apples look like the grapes from the fruit cocktail of my youth? Mmmm I can almost taste the chunks of apple looking at your photos. Absolutely fantastic! I had some apples that I wanted to use up and clicked on your site today and saw these yummy things and decided I must make them. So make them I did. And they were fantastic. Purple spuds, no. Apples – YES! THis one is up front in the morning… my kids and hubby say thanks in advance!!! Sarc-tastic. I actually have a visceral reaction when my phone rings, so I understand this completely. Nonetheless, your more brief intro was no less entertaining – so take a load off, it’s the weekend! Would this recipe do well with blueberries – to which I’m always leaning? Oh, these look amazing!! I’m always looking for new ideas to bake with whole grains…thanks for the recipe! They look phenomenal the way they are, but if you want a deceptive way to add more health into the muffins, try adding a couple tablespoons of ground flaxseed – nobody except you will know that it’s in there! This recipe was the perfect excuse for using up the buttermilk that has been sitting in my fridge for the past week. The apples soften up just enough to contrast with the brown sugar crunch on top. What a lovely treat on Sunday! And your photos are gorgeous. I love the new dark background/side lighting set-up you’ve used lately…truly beautiful! Hope you had a nice weekend. These muffins are baking in my oven as I type! They’ll be the perfect treat on a wintry spring afternoon (38 degrees in Chicago). Thanks for all of your great recipes. Does anyone know if I could substitute all the flour for spelt flour? I’m trying to make gluten free snacks….any suggestions? Spelt is not a gluten free flour. Do you think this recipe would work with green anjou pears? This recipe looks similar to the one that Ellie Krieger from the Food Network makes. I wonder if she based her recipe on this one. Hers turn out really good and these look great as well :) I will have to give them a try. The lid, most definitely, is the best part! Now that’s an apple muffin. Big chunky bits of apple!! Just made these for a wee dinner party. Fan-friggin-tastic, even in our tiny and quite crappy oven (seriously, I think I’d do better with an EZ Bake). Anyway, these were delicious. Thanks! I confess, sometimes I just eat the lids. Or, rather, pick all the topping off the lids and leave the naked muffins for someone else to eat. These look so fabulous and follow my “more whole wheat flour” baking technique so well that I have to make them right away. Well, as soon as I go grocery shopping, since the fridge is bare of apples and pretty much anything else right now. Oh these look FANTASTIC!!! I can’t wait to make these later today! I must confess, however, I often just eat the lids too! I was thinking about investing in a muffin lid pan but then realized I would only be fueling my bad habits! I love to just look at this site, but never attempted to try anything. I just made these muffins and I am fighting the urge to go and eat every single one! Next time I will even put a little more brown sugar on top…! Made these over the weekend…they were amazing. Everyone loved them. The texture was perfect and they were just as great the next day…especially warmed and with some vanilla ice cream (hey, i like ice cream). I got so many requests for more…thanks for a great recipe with beautiful pictures. Thanks so much for that recipe! Made them yesterday. They are done in no time and sooo delicious! Crazy moist indeed!! My boyfriend was like ‘Now this is what I’m talking about!’ ;) I’m definitely going to make them again soon. I haven’t made muffins in ages, Deb, and these are so tempting! I love baking with apples. I just finished chowing down one of these fabulous muffins for coffee break – wow, they are so moist and yummy! I added one more apple than called for (I really like a fruity muffin! ), and they are very appley, awesome. I also got about 18 muffins, though as I currently only have one large muffin tin I had to put the rest of the batter as mini muffins, which is no big deal cause my husband is a huge fan of the mini muffin. One thing I wanted to say is that I switched out the butter for veg oil, and then actually reduced the oil to 1/4 cup and a 1/4 cup of applesauce. These muffins lend themselves to adaptation and you can make them really healthy, which I like. I try to bake a “healthy” muffin a week as snacks for lunches – these fit the bill this week, and maybe next week too! Thanks Deb! I’m a long time lurker but had to de-lurk to say these are the best muffins I’ve had in a long, long time. Moist and cinnamon-y and the brown sugar on top was delicious. The boyfriend was practically salivating in the living room waiting for them to finish; they smell SO good! Perfect little breakfast for a non-breakfast person like me. Thanks Deb! Oh, wow! I just made these with the intent of sharing them with a study group tomorrow morning but I’m not sure they’ll last the night. Absolutely fantastic. Especially the brown sugar coating on top! None of your recipes ever disappoint me. I made these this morning for my roommate and for my boyfriend – and they BOTH loved them. Thanks for posting something that made me look good! I am eating one of this muffins as I type. They are delicious and super easy to make. I was able to put them together while my dinner was cooking and got them in the oven right as my dinner came out. I didn’t use muffin liners, just greased and floured my muffin tin. Also, I made 12 really big muffins, had to kind of poke the batter into the tins, but it worked just fine. Took these on a long car trip for breakfast and they were a big hit. Next time I think I’ll reduce the butter and replace it with applesauce. These look so yummy. Wow. I’m giving this a mention on Sofachip later today! I’m stopping on my way home tonight to pick up apples to make these! They look sooooo good. These muffins were a big hit at my work meeting! I reduced the butter to half a stick and substituted a 1/4 cup of unsweetened applesauce, and it made them really appley! Toni, thanks for that link. While looking at Deb’s recipe I was thinking ‘that’s a lot of sugar.’ Although I’m sure its delicious, I’d like to reduce my sugar intake. My buttermilk curdled twice and it was only the third attempt when i alternated the dry and buttermilk into the beaten butter that it worked. Still glad i tried it because it was the best muffin i’ve made. Reduced the sugar and it was still sweet enough. Delicious! My husband ate 2 right away and went back for the 3rd shortly after. Thanks so much for the delicious recipe! I made these today too!! I made one change, I grated the apples. The muffins are moist and tender and delicious! Thank you for having such a lovely blog! I’m still learning the ropes of cooking, and the recipes of yours (these muffins, and the peanut butter brownies) that I’ve made have been such huge hits with my friends and coworkers. I made these muffins the other night and they didn’t last through lunch the next day once I took them in to work. I chopped the apple a little too coarsely, I think, but they still came out delicious. These muffins were sooooooo good!!!! Thanks for the recipe! Did these, but because i have a gas oven, and am also high altitude, the temperatures given were way too hot… the brown sugar began to burn in in the first minute and smoke alarm went off.. So I dropped the temp to 400 for the first section, and 375 for the second… might take a bit longer, but still Great! these were awesome. i used one granny, one fuji and plain nonfat yogurt. delish! thanks! Loved this recipe! No whole-wheat on hand and I used milk + cream of tartar instead of buttermilk, but they still came out delicious! Just wanted to say that these muffins are divine! I just made them today and I’m having trouble not going into the kitchen again for thirds. I used yogurt in place of the buttermilk and didn’t skimp on the brown sugar topping as suggested. Thanks for turning me on to this recipe, Deb! These were great! I made mine with two pink lady apples. Also, I got 12 muffins from my silicone pans. I notice that with my pans, they are a bit larger than I guess the standard muffin/cupcake pan. I can not use cupcake liners in mine because regular cupcake liners are too small. But since it silicone, it’s no loss. I think I will make this as a coffee cake or in a bundt pan next time. Wow. These are the best baked good I’ve ever made, and I’ve made a few. It’s pretty crazy this is from a bag of flour! Normally I find those recipes questionable… Thanks for an awesome muffin recipe! Not sure if this might have been posted before, but 82 comments are a lot to quickly read through :) I somehow couldn’t find this recipe in your recipe index and only re-discovered it when searching your site for “apple muffins”. Which means, I will most likely be making them sometime soon! wow! just made these today and they were fab! I even tried to make them a bit ‘healthier’ (by using ALL wholewheat flour and adding 3 apples, skins and all!) and they still turned out great. They hardly rose at all so fill them right to the top!! Thanks for the recipe, I’ll definitely be making these again! These are FANTASTIC! I made them a few months ago and am fixing to bake them again tonight! Thank you oh-so much! I made these today and they are really really good and was so easy to make. Thanks for the recipe! I just made these with a few additions – ground flaxseed, wheat bran, rolled oats, and chopped walnuts. I also added an extra splash of milk to compensate for the extra dry ingredients, and they turned out great! pretty good. Just had one with a glass of milk. Next time I would use a more tart apple for contrast and probably a bit less cinnamon, maybe some ginger instead. But these have a lovely texture and are very tasty. BTW you can go ahead and let the egg/butter/sugar/buttermilk mix curdle, same as with any cake: the flour will bring it all back together again with no tears. Hi — this recipe looks delicious, but I’m not clear about the temp to set oven at . . . 450A??? Help! I was distracted when I made these (with yogurt) and messed the blending/mixing sequence up and put them in at 350 only to realize five minutes later, when I jacked the temp up. So they could have bombed, but no, they were fantastic! My daughter’s got some great lunchbox treats coming her way — thanks! I halved the butter, replaced all of the sugar with 1/4 cup of light brown sugar, replaced the buttermilk with 1cup soy milk and 1 tbsp of lemon juice. Additionally, the egg was replaced with 1tbsp ground flax seed and 3tbsp water set to the side to make a flax egg. They turned out well, with a light flavor. I didn’t expect them to, though. what kind of apples would you guys suggest using? Anything you have on hand. Granny Smiths are often used for baking, but I like using those yellow ones (because they’re not very watery) and MacIntoshes, too, (because they bake quickly). 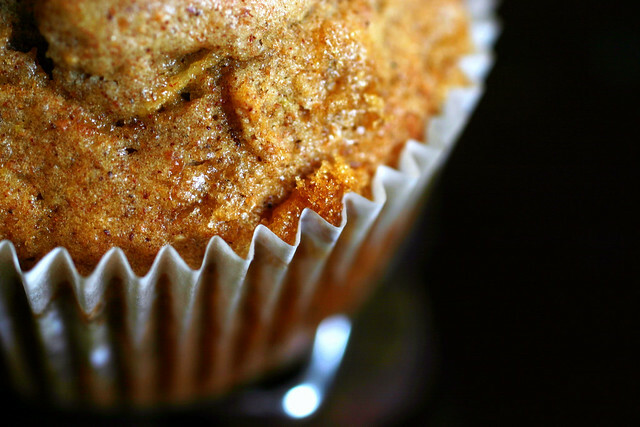 These muffins are fab…I used apples from the orchard and they turned out wonderful. I followed the receipe exactly and used the yorgurt. My hubbie ate five of them the first night! They were very easy to make and my son loved helping. Perfect with afternoon coffee! ahhh…i can’t wait to try these out! i just picked orchard apples up in julian, ca this wekend…was looking for a good apple recipe. thanks! I had a couple of apples and made these today for a coffee morning. Luckily i had one before everyone arrived as there are none left. Absolutely delicious! I made these last night and had to restrain myself from eating them all after coming out of the oven. I brought them in to work and everyone said they were the best they’ve had. Everyone wanted the recipe. I used Yoplait thick and creamy blackberry harvest for the yogurt. Can’t tell if it really made a difference though, I’d have to taste them with regular. Also I got 12 fairly large muffins, I filled the cups almost to the top, and they rose quite a bit. This is great, thanks so much. Great photos!! Just wondering, could you make these with strawberries instead of apples? By the way, i make this all the time now and they have become a family staple for us. Love them! we are all allergic to dairy and soya products. what can i use instead of the buttermilk? There are a number of milk substitutes out there. Some are good for baking, some not. The ones that are carried at the grocery store around here are almond milk, hazelnut milk, soy milk, rice milk, oat milk, and hemp milk (odd isn’t it? Tasty though. It’s rich and creamy, similar to soy, though as I’ll note in a minute, horrid for baking.) Natural food stores will carry most of these, and your grocery store should minimally have soy, rice, and almond varieties. Hemp milk definitely goes sour when baked. Rice milk does too, though much less so. That leaves hazelnut, almond, oat, and soy milks that can be used for baking. Which ones you use is entirely up to what you think will complement the dish most. Soy tends to lend that strong soy taste, but it it rich and creamy. Hazelnut is the nuttiest of them, but also rich. Oat is my personal favorite, as it is flavorful without having any overwhelming flavor. Almond is my second favorite… slightly nutty. To make buttermilk from any of these ‘fake’ milks, simply add vinegar. The proportion is 1 tbsp vinegar plus enough milk to make 1 cup of liquid. You let it sit for 10 minutes if you are using real milk, but I haven’t found that makes a difference for ‘fake’ milks. So fantastic! My butter/sugar mixture did curdle when I added the buttermilk, but when I added the flour it became smooth, and the muffins were great! It was a nice way to use up a few Fujis that were looking a little banged up. These muffins are wonderful!! I added 1 tsp. vanilla to the batter and in addition to topping them with the brown sugar I used 1/4 cup chopped walnuts and sprinkled them on top also. Yummy!! These were delightful! I fell for the pictures right away, but the recipe was a big hit. My 4 year old and I made these this afternoon. She cut up the apples with a butter knife so the chinks were a little large. I used King Arthur white wheat flour and substituted .5 cup of the total flour with wheat bran. I used all brown sugar also, but cut it in half. I made them into mini muffins and they turned out perfectly. I think next time I will substitute half the butter for applesauce to up the apple flavor. I m=will make these again very soon! I made these for the kids I was babysitting. They looked so delicious and they tasted GREAT!! The kids loved them! Thanks! It’s always nice when muffins actually look like they are supposed to on the website. :-) These are delicious! I used the last three apples in my fridge: 1 Fuji, 1 Granny Smith, and 1 Red Delicious. Also, instead of buttermilk, I substituted with 1 cup of milk with a tablespoon of lemon juice. This recipe is definitely a winner — thank you! hi, i want to make the muffins non-dairy is there anything i can use in place of butter milk or yogurt? Wow those muffins look really good ! My daughter is allergic to all dairy and nuts. I just baked these and they are tasting mighty fine!!! And considering it’s under the “healthy” muffin category, it’s simply divine! Moist and the apple chunks were delish! Mine didnt rise as much though but who cares! It taste great! I like it that it’s not that sweet too! I made these to bring to visit my husband’s sister at college. They were amazing! So fluffy and delicious. I used Braeburn apples and didn’t skimp on the brown sugar on top. Thanks for the excellent recipe! Wow. These turned out amazing tonight. I could eat them all. I made them for snack at my daughter’s preschool tomorrow. It’s her birthday so I can make a “healthy snack” instead of cake. I made mini-muffins and baked them for 6 minutes at each temperature. The only other thing I did was use yogurt cheese instead of all yogurt. I didn’t have enough yogurt but did have some yogurt that had been draining for a few days so that its texture was more like cream cheese. These are lovely and truly are the best muffin that has ever come out of my oven. Thank you for sharing. I thought my batter was a bit dry so added about 1/4 c – 1/3 c unsweetened applesauce. Turned out perfectly! Consistency of the apples is just that of a pie and the muffins are delicious. Very light and fluffy for whole wheat! I do not deserve how well these muffins turned out. I did everything wrong from accidentally melting the butter when trying to soften it in the microwave (put it in the freezer for a few minutes afterwards) to most likely curdling the sugar mixture when I added the yogurt (the low fat kind) to yanking the muffins out of the oven 5 seconds after I put them in there hoping like crazy that the thought of rising hadn’t even entered their little muffin heads yet while I dumped brown sugar over the tops. Realised my wheat flour was strong (is all wheat flour strong?) and my egg was only medium rather than large, not so big a deal. I think they turned out well just to spite me! I turned these muffins into a coffee cake as an easier to make healthy treat for my staff at school. I am the school nurse. Everyone loved them. Alas, I don’t remember exactly what I did. Here’s what I do know I did; I used all the same ingredients as the recipe called for-using buttermilk, I put it in a 9 x 13 greased and floured pan, I sprinkled some coarse white sugar on top in addition to the brown sugar (I don’t want my staff too healthy-they won’t need me anymore! ), and I baked it as for muffins-first at 450 for 10 minutes then down to 400 for- and here’s the part I don’t remember-I think it was 20 minutes or more. A teacher also made this recipe and she said she accidentally put all the brown sugar in the cake and baked at 400 for 20 minutes and her’s also was good. I have made the muffins many times and they are sooo good and I feel virtuous because they are healthy-but I eat way too many and so cancel out the health benefits! ok ok ok! My 3 year old and I will make these! I’ve just bought him real but child size whisk,rolling pin,bowl and flour sifter (with a rolling handle to turn the centre of the sieve). Muffin stuffin here we go! Thank you. My daughter is allergic to dairy and eggs and so I used an egg replacer and made buttermilk with her soy milk and they were still delicious. I can only imagine how great they would be if they weren’t dairy and egg free!! I also ground up quick cooking oats to replace the AP flour and also replaced the apples with strawberries – wonderful. I have a bunch of plums and am thinking of substituting plums for apples. I know I bought out of season – go ahead and spurn me and then help me. Anyone tried substituting fruit other than apples? I used less white sugar (1/4 cup instead of 1/2 cup) because my apples were on the sweeter side. I also put in more apples because I wanted to use up as many as I could. My Harlem supermarket only carries lowfat buttermilk (don’t ask) but it all worked like a charm. This recipe is definitely a keeper. I made these last week. They were absolutely fabulous! My almost 4 year old loved them so much she asked for them again, so they’re baking right now. I skipped the sugar on top this time – I wasn’t a huge fan of it, but these are seriously yummy! Has anyone tried making some sort of streusel/crumb topping for these other than just brown sugar? i am trying to find a really good streusel topping recipe….. These were soo good! I just used regular old yogurt, added some vanilla extract (because in my mind, you can’t bake anything without vanilla extract) and sprinkled the top with brown sugar and cinnamon. It took everything I had not to eat the tops off of all the muffins. Thanks for another winner! Eating one of these right now! Sooo good. I used all whole wheat flour, all brown sugar, applesauce instead of egg and regular milk. Turned out great! I just made these tonight after searching all day for muffins to bring for a picnic tomorrow. They turned out BEYOND delicious. Thanks so much! I just stumbled upon this site today and I will definitely be back! I made this last night for a brunch this morning and they’ve been a big hit. I used light brown sugar instead of dark and plain, full-fat yogurt instead of buttermilk because that’s what I had on hand. They turned out unbelievably moist and light. Definitely going to make these again – great! I make these over and over again. Love them! I made these last night, and YUM! I had less than a tsp of cinnamon so I added other spices, and I misread the amount of butter and shorted it by 2 tablespoons. Oops. They were still so moist and soft and yummy! I’m excited to try some substitutions to make this more diabetic-friendly, and I’m sure they will come out fabulous. Thanks again for such wonderful recipes! No reason they wouldn’t work with peaches. Last night I wandered home from a Prospect Heights bar and had this urge to bake. As a recent transplant to Brooklyn, I felt a bit homesick and wanted to cure it with some warm goodies; a reminder of waking up to the comforts of my mother’s baking. After some internet sluething, I came upon your wonderful whole wheat apple muffin recipe. The beautiful photography drew me in and it was almost as if I could smell them through the computer screen. So at 2am I busted out my bowls, spoons, whole wheat flour, etc and felt the homesickness slowly melt away with each ingredient added. This recipe is so amazing because the muffins were easily made semi-vegan as I used Bob’s Mill Egg Replacer and even then they hit the spot. So in addition to being eggless and tasty, I also used 1 apple and 1 pear to switch things up. Needless to say, this recipe was well received by my new roommates and I will be sharing some with my neighbors! Thanks! I’m part of a Jewish group on campus that goes apple-picking every year right before Rosh Hashonah. Last year I decided to make apple muffins with what I had picked, and they didn’t come out so well–the recipe indicated you could use either white or wheat flour, and I made the mistake of using only wheat flour, so the muffins came out too crumbly. We went apple-picking once again over the weekend, and I came across your website while looking for a better recipe to try. I just finished making them, and they came out PERFECTLY. They were moist and sweet and delicious! The apples I used were fairly large so I only needed about one and half. I’m so pleased with how they turned out that I’m going to make another batch for when I go home for the holiday next weekend. Thank you! These were fabulous–I too got 18. Used two honey crisp apples and they were amazing. I didn’t have enough apples for a double recipe (I never make a single recipe of any baked goods, to much work for just 12 jumbo muffins) so I added 2 chopped banana’s…and 6 grain flour was on sale, so that’s what I used in place of whole wheat. anyone try substituting canola oil for the butter? I am going to bake these today, only I always replace the butter with applesauce. Hopefully this will work. I’ll keep you posted on the results. Thanks again. These were AMAZING!!! I added a teensy bit more yogurt and made them in larger muffin tins (so i only got a dozen out of the batter). The extra yogurt in my second batch made them a bit more moist. They were a HUGE hit! THANKS!!! We went apple picking last week and this morning, my brother wanted to eat some apple pie. However, I was too lazy to make the crust and all that, so I made him these. HE LOVES THEM! I didn’t have buttermilk to I used yogurt. The muffins are VERY moist. I had already started creaming the butter and sugar together when I realized I had run out of eggs. I never run out of eggs! So mine had no egg, and they were still amazing. My 17 month old loves them. I was just introduced to Smittenkitchen this month and this is the 1st recipe I’ve made, twice in the past two weeks. These are the best muffins I have ever tasted and I have gotten rave reviews from everyone who’s tasted them! I got 18 both times I made them, thanks! So delicious. My daughter went apple picking 2 weeks ago and I have made all manner of apple baked goods since then . My usual apple muffin recipe uses apple sauce so I did a search for a recipe with fresh apples and found several. The first one I made was not nearly as tasty as these. These were perfect. No one would ever know they had whole wheat flour in them. (I used King Arthur’s white whole wheat flour) I didn’t have any buttermilk so I used the yogurt and it gave the muffins just enough tang to counteract the sweetness of the apple. I still have some apples so I think I’ll make some more and freeze them. I might try adding some walnuts next time . Thanks for a great recipe. wow! this muffins are truly delicious. thanks a lot for the recipeeee!!! i used honey instead of sugar and they turned out wonderful. you’re right, we cannot miss the brown sugar on top! this recipe is a winner…! thanks for sharing it. Just made these this morning. In an effort not to skimp on the brown sugar, I put on too much and mine are a bit too sweet. I also found the oven temp too high and mine almost burned a bit on the edges. The muffins themselves, though, are great. I used a granny smith and 1 1/2 red delicious. I also only had 12 muffin tins, so I put the remaining batter in a muffin top pan. The excess brown sugar was even more of a problem here, but if you think of it as candy, it’s faboo!! Hi! I discovered your website a few months ago and have been an avid reader since! I love your writing and always look forward to new posts! I’ve made a couple recipes and am typically shy when it comes to commenting. But oh my goodness, these were so delicious that I just had to say something! My husband and I decided that they may need to be our morning staple :) Thank you so much for the recipe! These were so good with fresh fall apples I made them twice! The first time I used northern spry apples, and added the extra brown sugar topping 10 min after I had started cooking (I almost forgot about it). The sugar granules that didn’t land on a muffin burned and left stains on the pan, but the muffins themselves were great. The second time I made these muffins, I think I used jonathons (also good) and added some minced dried cranberries and extra cinnamon, and used all of the brown sugar in the batter. Both ways were delicious! I just made these, except I only used 1/2 cup white sugar and 2 mediumish apples. They are SOOOOOOO good! Thanks for the amazing recipe! These look like the perfect rainy day project. Or snowy day, rather! Baked for a birthday brunch; big hit! And the smell in the kitchen while they were baking….my toddler was jumping up and down in front of the oven the entire time! just made these, only sub. was unsweetened ricemilk+vinegar for the buttermilk. halved the recipe and it made 12 full muffins! also sprinkled a turbinado packet on top – may have been overkill but good lord they are delicious – and 150 calories a pop! Thank you for sharing this recipe ..this came out delicious ..
Long time fan of your site and cooking, finally delurking. My husband and I made these last night and I have to admit we couldn’t wait until breakfast to try one — the combined aroma of cinnamon and apple was irresistible! We doubled the recipe, halved the sugar and added about four tablespoons of flax seed to the white flour measurement. This recipe is a definite keeper! I made these last night and they are absolutely the only muffins I’ve ever made that I’ve been happy with. I will make them again and again. You are amazing! No smitten kitchen recipe has failed me yet. DELISH! Made these yesterday and even my dog loved them. Very moist and the kitchen smelled heavenly. And yes even the boyfriend, who is like “no whole wheat for me”, loved them! Will definitely make these again! These are so good!! So moist and delicious! I blogged about it on my new blog. And I agree with Frances – No smitten kitchen recipe has ever failed me! Thanks for the beautiful site! These just came out of the oven 10 minutes ago. I used peach flavored yogurt and it still came out pretty good. The pictures sold me and thanks for the recipe. I’ve made your chocolate chip cookie recipe too and they’re fantastic! Thanks for sharing your expertise. Love these muffins and bake them all the time. Smitten is my go-to for all recipes! I am baking your wedding cake recipes in March and taste-testing has been awesome! Great recipe!!! Just made these and they are delicious. I added pecans to the mix (mostly b/c I’m from Texas and we have a tendency to add pecans to everything that can be baked) which complemented the chunky apples and cinnamon quite well.. These are great made with all whole wheat flour instead of half whole wheat, half all purpose flour. And I only use 1/2 stick of butter, just add a little applesauce to make up for it. Good morning from snowy Madison, WI, Deb! I took a swing at this recipe last night and came up with a home run. Since my muffin tins are packed away, I used a 9×5 loaf pan; yes, all the batter fit without overflowing. Additionally, I made a handful of small edits: inspired by your brown sugar-substitute recommendation, I used all white sugar with a bloop of pure sorghum; on top of the loaf, though, I used turbinado sugar. The crunch and flavor were a perfect contrast! As for apples, I used some Cortlands I’d had kicking around from early October; they held their shape AND flavor, so I recommend that other bakers with old apples give this a shot (instead of automatically relegating the oldies to something like applesauce). And, for a flavor shot in the arm, I added a splash of lemon extract and a big pinch of ground ginger to help cut through the sweetness. The finished loaf was just this side of underbaked, so I’ll probably cut the temp down to 400 for the entire bake. Also, I’ll cut the sugar back a bit for my taste. Overall, though, I loved this recipe. It’s a great way to use up apples; it’s got a good shot of whole wheat nutrition, it uses much less fat than many other such fruit quickbreads, and it’d be great with, say, sharp Cheddar and toasted pecans tossed in, too. Yum. Thanks, Deb! I thought these were delicious, even though my brother-in-law said “hmm….they taste healthy.” Healthy or not, I decided to use all whole wheat pastry flour, added 1tsp. nutmeg, non-fat greek yogurt, and pecans. These muffins were so incredibly delicious and the apples are such a nice treat. YUM YUM YUM, especially with butter on them!Thanks for the inspiration! I made these muffins last night and they were incredibly delicious! Moist, tender and all! I replaced the buttermilk by 1 tbsp apple cider vinegar in soy milk, and used an egg replacer since I don’t eat eggs. Couldn’t believe how good they turned out. I loooooove the apple chunks. Thanks for this recipe! These are DELICIOUS. They’re so moist and sweet that you could probably halve the butter + sugar and have a healthier muffin. Next time I want to try adding walnuts. Made these last night, and they were delicious. Left off the topping and added some ground nutmeg and cloves. OMG I just made these with my son and they were so amazing!!!! I made then with spelt flour instead of whole wheat with plain yogurt and 2 big braeburn apples. I love how they don’t even stick to the muffin papers either. The are so moist…this will be my new go to muffin recipe I might try substituting the all-purpose flour next time with something else. I made a few substitutions as well. little less than 1/4 butter so topped it off with applesauce (wasn’t unsweetened so also reduced the sugar to about 1/2 cup total-only used yellow and dark brown sugar – next time might add just a little more sugar)…had stone ground whole wheat…little less than a cup and topped it off with a little roasted flax seed meal…added a little more yogurt than called for since I had some extra I had to try to use up…and also taking into account maybe the stone ground flour would make the batter drier than if it was regular whole wheat…I don’t know if that’s the case but any way it turned out great. Also added a extra apple not knowing if I had 2 large apples or 2 mediums…hehe…The muffins I sprinkled a little sugar on top were a bit tastier because I reduced the sugar so much they hardly were sweet…so helped to have a bit on top. Almost over baked them since I think I made slightly smaller muffins I got about 20. Knowing my oven was a bit warmer…I started off with 425F and then down to either 400 or 375…10 mins and then 5min. probably could have taken them out a bit sooner. Or let’s just say they turned out perfect! They weren’t dry or anything. Just made these and they are super delicious. I made pretty much all the same substitutions as Peggy (#176) – funny – except for the flaxseed. Got 18 by using just under 2 scoops of a large cookie-dough scoop, which makes it really easy to get it into the muffin tin. That trick was a “duh!” moment when I saw a professional chef in a baking class do it. So much easier than a spoon and dripping bits all over the muffin tin. Anyway, this is a keeper recipe. Thanks! sooo much butter and sugar. options? Read through the comments and you will see how many other people have adjusted it to use less. Made these last night for a post-run brunch this morning (with some adjustments…read: chocolate)…another Smitten Kitchen score!! Even posted my adapted version of your recipe on my new blog. You never cease to please!! As I type this, I have 15 mini-muffins cooling (it was 16), and 10 regular size in the oven. My only substitutions were 1/4 cup canola oil and 1/4 cup unsweetened applesauce instead of the butter, and yogurt instead of buttermilk. I did add a few pecan pieces too. For the mini’s, I baked them for 12 minutes at 375. Fantastic as always! Thanks Deb. I just made these! The smell coming out of the oven within 3 minutes is fabulous! I really enjoy your site. I am a baking & pastry student, and I get really inspired with your blog. Thanks so much for all you post and do! Just wanted you to know that I am a high school Foods teacher, and we make these (no substitutions) as part of our Muffins unit. The kids turn their nose up at the words “whole wheat”, but once baked and tasted, they consistently agree that these are the best! these are in my oven right now ….Lord have mercy it smells so good in here i am DROOLING already ! This is the third time I’ve made the muffins in two weeks. They’re wonderful! I’ve tried the substitutions of rye flour for the wheat, and reducing the butter to 2 Tbsps — still a hit with everyone who’s tried them. I’ve found that greasing (rather than greasing and flouring) works better. Delicious! I substituted 2 tbsp of applesauce for 2 tbsp of butter, and they were very moist. Also, I had dark Wilton muffin tins so I baked at 400 for 10 mins then at 350 for 5 mins and they were perfect! The first batch I baked per the instructions with a light, smaller tin and the Wilton muffins were much better. Thanks for the recipe! I used all greek yogurt b/c i had no milk or plain yogurt and the batter was so thick that i ended up having to add soy milk to compensate. They turned out great anyway. Based on all the comment you can do anything with this recipe and not mess it up. Made some adjustments to these, with happy results! Changed 1/2 c granulated, 1/4 c brown sugar to just 1/2 c brown, with a good sprinkling of brown sugar on top! I just made these this morning, and they were delicious. My 12 little muffin cups couldn’t hold all the batter, so I put the extra in a little loaf pan; it took a bit longer to bake, but it was still good. I substituted 1T vinegar+milk for the buttermilk, since we NEVER keep buttermilk around here. And I used 2 enormous fuji apples (perhaps too big). Next time, I would use slightly smaller and less juicy apples — these seemed to leak during baking, so my tester never came out clean. I just pulled them out a couple of minutes after they smelled done. I just found your website this week and I love it! My husband and I made these for dessert tonight and they were AWESOME!! Thanks for sharing. Keep up the good work. I made these muffins today, I substituted blackberries for the apples because they were on sale and I mixed minced candied ginger with the brown sugar for the topping. I got 18 muffins out of the recipe and they are excellent. Thanks for sharing the recipe. I am in love. And have just realized that I have been muffin deprived for 22 years. I used to get SO excited when my mom would make blueberry muffins, when they were really these hard, overly salty rock muffins, with blueberries as their only redeeming quality. But I still loved them. And we would make them together, I think that was the best part. I added 1/4 tsp nutmeg, and added raisins. Great addition. I also made a spiced oat streusal topping, and really piled it on the muffins, which made them FANTASTIC. Next time I will try some walnuts or sharp cheddar. These were pretty spectacular. I halved the recipe, and still ended up with ten [How so these people end up with sixteen in a regular batch?!]. I doubled the salt, but still felt they could use more to bring out the flavor; however, I am a salt addict and it may just be me. I’ve been using your site (bookmarked) for quite a while now, but this is the first time to comment. We LOVE these muffins.’We’ is me, hubs, and 4 kids (1-8), and now our foreign exchange student, who previously didn’t eat breakfast, has requested these twice. I’ve used all sorts of apples, including some really questionable reconstituted dried rings I found in the bottom of my dried fruit bin, and they’ve all worked fabulously. I’m making the banana bread tomorrow morning, will comment once we’re done. I bought freckled bananas just for the occasion…and my green-banana-loving crew has not let me live it down……until tomorrow a.m. me thinks! These are delicious!! I’ve made them three times in the past month- they are so moist and stay like that for several days. They were a big hit at my sister’s baby shower. Question- do you think rhubarb could be substituted for the apples if I add extra sugar?? I forgot to add the brown sugar on top. Daaaaang. As they are, they’re pretty darn good. Suuuuuuper moist. Yum. I just made some muffins based on your recipe. I used peaches, blueberries, cherries, shredded carrot and walnuts. I didn’t see the note about the brown sugar so I used the whole 1/2 cup inside instead of 1/4 in and 1/4 on top. I didn’t feel like it was missing anything. I also added some vanilla and almond extract and a lot of fresh ground nutmeg. I also didn’t have any milk so I used a flavored yogurt cup and some sour cream. I also used some applesauce and oil when the batter was still too thick. These really hit the spot. Thank you for the inspiration! Just made these and they are DELICIOUS! I substituted applesauce for some of the butter and used yogurt instead of buttermilk AND added some flax seed. So, so yummy. My house smells wonderful, too – great side effect of this recipe! I have been eyeing these for a while and just finally made them last weekend. They tasted a little – uh – healthier than I had hoped. Could that be because I couldn’t find my beaters and mixed by hand, so the mixture wasn’t quite “fluffy”? I want to give them another chance, I really do! These were so light and fluffy! I made some mini muffins and some medium sized. I only wish that I had cut the apple chunks smaller for the mini muffins. Mmm, the taste of Fall! Thanks! Oh, and cutest baby ever! This recipe is a keeper! My buttermilk curdled a little (don’t use a stand mixer for that part…), but I forged ahead and they turned out great. These muffins truly hit the spot deliciously most sweet and apply! Thanks for a new fav! I just made these, and they are delicious! Perfect way to kick off the first day of my favorite season. Here are the changes I made for my batch – I used light brown sugar instead of dark, substituted applesauce and milk for the buttermilk, added a splash of vanilla, a bit of nutmeg and stirred in chopped walnuts. Thanks for a great recipe! Oooh, same as the comment above…I didn’t notice about adding half the brown sugar to the batter…I added it all and used more to top them. Still turned out great! I just made these, added raisins but otherwise followed the recipe to a T. They are so moist and delicious! I actually made 4 different kinds of muffins tonight, all recipes came from blogs, and yours was the BEST out of all four. Love them. Thanks so much for sharing! These are going to be my go-to fall muffins. So easy and delicious. I just had time to do the dishes, clean the counters, and start a pot of coffee in the 15 minutes before they were ready. Side note: I think the buttermilk started to curdle when I added it, but the muffins turned out fine. I think everything comes back together either way, so don’t stress if it looks a little funny when you add the buttermilk! Wow! Just finished making these with some apples from this weekend’s apple picking excursion. I used a 6 oz container of 0% fat honey flavored greek yogurt since it was all I had on hand and it worked beautifully. Also, I made a mistake and added the entire half cup of brown sugar to the mix but it wasn’t a problem at all. Lastly, I made these as mini muffins, since they are the perfect size for my 1 1/2 year old. I appreciated all the timing info in the comments above. Cooked mine at 380 for 12 minutes. At first I thought they might be undercooked but I took them out anyway and let them sit for a few minutes. So glad I didn’t cook them any longer. They are perfect! I’ve really been enjoying the gorgeous pictures on the site and I finally decided to give a recipe a try! Perfect time to finish the last two apples left from the week . I was a little skeptical at first (the batter was SO thick) but they puffed up beautifully in the oven. I used nonfat greek yogurt and I tossed the extra topping sugar with homemade candied almonds chopped small. Added an extra crunch! Heading north for apple picking this weekend-just in time to restock for the next batch!! Oh, also, I didn’t peel the apples, which saved a bit of time, and they were still delicious. 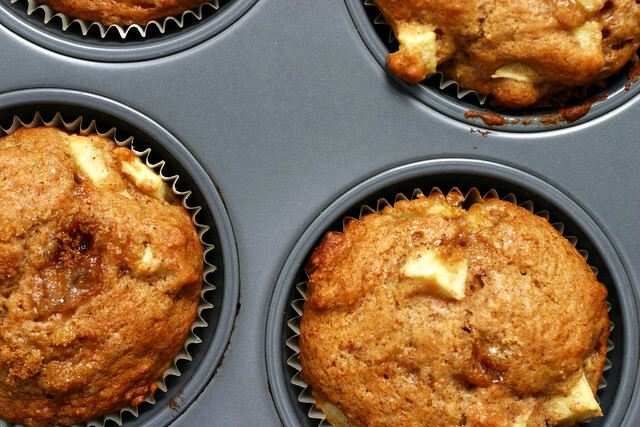 I liked the high apple-to-muffin ratio in this recipe. I just made a batch of these muffins. I was inspired by you but made some changes. I added some vanilla extract, some nutmeg, ginger and has some vanilla flavoured yogourt. Delicious. I just wasn’t sure if this was muffin or cake batter some didn’t mix it as much as I might have. All things said however, they were delicious even without the topping. Thank you. Also, I roasted the apples to give them more depth. Thank you for this recipe! I have been looking for recipe after recipe to use the 3 dozen apples from apple-picking! They look so delicious that I just linked one of the images onto my blog. Thank you for sharing! What kind of apples would be good to use for this recipe? just made these and they are delicious. I used “bubble gum” apples, which are kind of sweet and firm, but not like a Granny. Thanks for sharing all your fabulous recipes, Deb. Made double batch this weekend with apples (Cortland)I prepared and froze last week. I also added crystallized ginger bits. They are fantastic muffins!!! Will become part of my repetoire for sure now that I have a stock of frozen apples in the freezer for the winter. I have been making a different muffin every week for my 13 year old son’s soccer practices (I am the coach). This was the recipe I used this week and we all agree that it is the best of the season. Truly delicious! BTW: The only thing I changed was switching out the white flour for white whole wheat and the white sugar for light brown. When I first tried this recipe last weekend I think I did one (or three) substitutions too many. I halved the butter and added applesauce, used only 1/4 cup (light) brown sugar and no white sugar, a container of plain yogurt instead of buttermilk, all whole wheat flour, and enerG egg replacer. They weren’t terrible but they weren’t great either. Since it seems like everyone else had smashing success I was determined to try again and stayed closer to the recipe. The only substitutions this time were using milk/vinegar for the buttermilk and applesauce for the egg since I’m allergic. Needless to say they came out fantastic and I feel redeemed! Used this recipe to make whole wheat banana walnut muffins. I was skeptical about the high baking temp but it really makes a high- topped tender muffin. I blended one banana into the buttermilk mix and chopped and folded in the other banana. I left out the white sugar for a less sweet breakfast muffin. The banana pulp supplemented the moisture (I learned this helpful bit from David Lebovitz’s blog: that reducing sugar also reduces liquid in a recipe, since sugar liquifies). Good muffins! These were absolutley amazing. The second time I made them I decided to do a 3 to 1 ratio of wheat flour to white flour and I couldn’t even tell the difference. They were still extremely flavorful and moist. They were really a great sweet snack that didn’t make me feel guilty after eating them! All 18 muffins disappeared within 2 days! I used gravenstein ( in my opinion the best for baking but only available for a short time in late August here in the NW) apples and grated them (too lazy to chop). A perfect after school snack! Thanks again! Suggestion–you should indicate in the ingredient list to separate the brown sugar. I missed doing this, bc I didn’t read the directions, since I already know the process for muffin-making (mix dry, then wet, combine, blah blah). So I ended up using 1/2 c. brown sugar in the batter. Not the end of the world, but I still think it’s a good policy to note separation of ingredients, etc. in the directions. Trying these for breakfast this morning. Thanks! made these for Thanksgiving morning, perfect with a cup of coffee and the house smelled divine! Love the idea of the banana variation above – next time! I think I may have over baked these as they were almost on the dry side ~ but still quite good! Also, the sugar buned to the edge of the muffin tins and made the edge of the muffins black. I didn’t use paper baking cups, just greased the pan. Next time I’ll try the baking cups. I just made these for my 3 year old… I used sprinklers on top instead of sugar – Lovely! Thanks so much for sharing. I made these this morning and they were perfect! I did however add a cap-full of vanilla and I think I will continue to do this. Keep the amazing recipes coming! These are fantastic! Thanks so much for another great recipe. I added a little vanillla this time and might add chopped walnuts next time. Question though. They were awesome the first day and still really good the second day. The third day (today), however, they are super soggy. What is the best way to store them? I have them in a large ziploc bag. Any thoughts? I made these for the first time today using white whole wheat for all the flour and they are a big hit. I also used all coconut palm sugar and am pleased with the results. Love these muffins!!!! Huge hit at our house. I freeze them right away only because they will not be eaten over the next couple of days. They freeze really well! -I cut back a 1/4 cup of the white sugar and use Vanilla Flavored Yogurt(sweetened). -Use White Whole Wheat flour for all the flour. These are amazingly unbelievably delicious!!! I just baked these and I am amazed at how easy they were to make, yet they tasted like they took a while to prepare! Thanks for another spectacular recipe! I made an oatmeal-brown sugar crumble on mine, since I like a nice tasty crunch to my lids (obviously the best part of a muffin, natch). Eating them with a little bit of homemade apple butter and a tall glass of cold milk. Delicious! Just made a double batch of these as I had a lot of apples past their prime from a buy-one/get-one-free sale. They are amazing! I used yogurt instead of butter milk and had to add a little plain milk to help combine everything. If I make these with plain flour and white sugar would they turn alright? I can’t get whole wheat flour and brown sugar where I am, so I was just wondering. I’ve already made these twice. The apple chunks make them so moist! Thanks for the recipe! I made them with 3 apples, yogurt and added I flax and they are the best (semi-healthy) muffins by far that I’ve made. So moist and I sprinkled a little bit of sugar and oats on the top of mine for a little bit of crispy. Deb, you are one talented woman! Usually my puppy gets to lick the mixing bowl, but this muffin batter was so tasty I had to take care of that job myself…and I got so excited about how cinnamon-y-good it was, that I almost forgot to put the brown sugar on top! Two days later these muffins are still marvelous, and my husband has informed me that I should ONLY use this recipe from now on. Thank you for all the cooking/baking inspirations! I made these tonight and my batter was very thick (not pourable) so I had to shape with my hands and drop it into the muffin cups. Maybe because I used Greek yogurt instead of buttermilk? Regardless, they came out great and so delicious. I like that they aren’t too sweet. I found your blog searching for a recipe like this. Thank you, I’ll keep following you for more! These are my platonic ideal of a muffin. I just whipped up a batch of these and stuck them in the fridge to bake for an afternoon snack. :) They look and smell delicious already. I didn’t have buttermilk so I made it myself with heavy cream. I put a cup and a half-ish of heavy cream into my lidded mixing bowl, shook it up for about 5 minutes, voila buttermilk, plus butter which I used instead of ordinary unsalted butter. Have to wait and see how they turn out for the verdict, but I bet they’ll be scrumptious. I made these over the weekend (it got cold and yucky – perfect baking weather), and they are so good! My batter was also really thick. Reading the comments, it looks like it’s the greek yogurt that causes that. Maybe next time I’ll try it with normal yogurt. Although there no complaints here, the family is eating them all as I type this. One interesting note: I halved the receipe and still ended up with 12 muffins. But maybe my muffins cups are smaller than standard? These sound wonderful but I was a little confused about greasing and flouring the muffin cups. The photo shows you using paper muffin cups–do you use butter and flour on the tins if you DON’T use paper holders or do you us it on the paper cups? My boyfriend bought a bag of apples that turned out mushy so he gave me license to do anything with them. This morning, the urge to make a big brunch hit, so I made these! I used some Greek yogurt and daaaang. I just made a dozen of these muffins. Two of them are already eaten! OK…although it’s many years after the original post…I made these last night w/ a few variations:I swapped out 1/2 cp of ww flour for rolled oats, used an approximate amount of fresh chopped pineapple instead of the apples, used nonfat greek yogurt, forgot to cream the sugar with the butter and just added it to the dry ingredients after I had “creamed” the butter and egg (?!) but did NOT forget to sprinkle the tops w/ brown sugar. These were great!!!! Really great when they first came out of the oven, and pretty impressive when served for breakfast the next morning. Will absolutely make these again: might use a bit less butter as the yogurt made them very moist and the muffin papers were a just the littlest bit greasy. that said….yum! I wish I could tell you with absolute certainty how I “found” your whole wheat apple muffins, but ……… I am thinking maybe it was on Alana Kellogg’s “Kitchen Parade”. It really doesn’t matter ’cause what does matter is how happy I am that I did. I just finished mixing and baking a batch and am in Muffin Heaven! I used a half a huge Granny Smith and a normal size Gala. The ratio is 2/3 apple, 1/3 muffin and there are 21 muffins”’! No complaints here. update … 20 muffins. My partner and I shared the 21st one while it was still warm. OOOOh so good! These muffins are amazing!!! I made these a while back and have been searching for the recipe ever since! So glad to have found it again! i only had one apple, so i halved the recipe, but i still got ten muffins (which i guess is actually close to what you got, 18 out of a full recipe). i said hell no i’m not greasing and flouring a muffin tin (i hate washing them! ), so i used paper liners and sprayed them with cooking spray so i wouldn’t lose any delicious muffin to the papers :) added a pinch of ground clove, and topped them with some crumble i adapted from 101 cookbooks and keep in my freezer just for muffin emergencies. my batter was also pretty thick (used buttermilk), but spooned easily. my oven is stupid, so i heated it to 450, but turned it down to 400 as soon as i put in the muffins and baked for 15 minutes. probably could have left them in for another minute or two, as they are very soft and crumbly, but man are they tasty! YUM. Had to alter the recipe just a smidge with what I had – only white flour, green apples (3 small), greek yogurt. It only made m 15 muffins, but 15 AMAZING muffins. Made these in my usual baked goods making hours…10 pm to 2 am, and eating them with some cardamom ice cream I made the other day. DELISH. Perfect treat to end le day. And healthy….er….apples and whole wheat flour, apples and whole wheat flour! This is my new mantra. P.S. If you haven’t made cardamom icecream, you totally should. It is SO good, a little like vanilla ice cream, but the flavor profile is so rich and complex with the cardamom added in! Made these last night….delicious! Lots of compliments too! can one use granny green apples in this recipe? For those who want a super healthy version, substitute rolled oats for white flour and up the liquid content a bit by using 150% applesauce for butter. Choose regular nonfat yogurt over buttermilk and then throw in a little wheat bran for an extra dimension in the texture. I made these again last night–this is becoming my new Rosh Hashanah thing, in addition to Smitten Kitchen’s honey cake recipe! I substituted an 8 oz. cup of Greek yogurt for the buttermilk–it made the batter very thick and a little tough to work with, but the muffins came out perfectly and the yogurt made them moist and creamy! had a great time making these with my pre-schooler.My only problem was I found the heat to be way too high and they burned on the edges before the 10 min mark.So next time I will use lower heat. Also I used all King Arthur White Whole Wheat flour instead of a 50/50 mix and reduced the sugar a bit because my kiddo does not like sweet things. They were a total hit though and the first muffin he has willingly eaten with “chunks” in it. I’ve had this tab open for two weeks and finally made them today, and just… WOW! I had no buttermilk, and was forced to subsitute 1/2 cup cream and 1/2 cup yogurt; pretty sure the cream didn’t hurt the cause. Thanks for the recipe, and a general thanks for your wonderful blog! I just made these for my office and they absolutely LOVED them! As did I, of course. I’ve actually never baked with whole wheat flour, and was pleasantly surprised :) Thank you for such a solid recipe! This is great! I made two times already and it’s a hit to my friends and family. Thanks so much. Not too sweet and stay moist even after 3-4 days. Highly recommended! btw – I did mine with yogurt since I didn’t have Buttermilk. I think it cuts down a little of fat and trust me, the taste is still great. Delicious! I didn’t have buttermilk, so I made some (milk and lemon juice). I used 4 medium apples and added some all-spice and nutmeg. My two-year old ate 3 with some apple butter. Made these this morning for my college’s Applefest! They were incredible!! I never have good luck baking muffins, until now. So excited to make them again and try them with banana too. Thanks! These were very good, but burnt around the edges. I was hesitant about baking a muffin at 450, especially with the brown sugar topping, but the reviews were so good that I went with it. Within minutes the brown sugar had burned, and the outsides were much too dark. I brought the temp down and they are edible, but very dark. Total cook time was about 12 minutes. I checked the original King Arthur recipe, and sure enough, they bake them at 375. Not sure why this has such a high temp. Hi Mary — In the second paragraph, it says “Bake for 10 minutes, turn the heat down to 400°F…” So, it shouldn’t stay at 450. Hope your next batch is more successful. I always try to replace the butter with applesauce whenever I bake in order to cut down on the fat, and it also adds to the sweetness a little. They turned out amazing! I had never even tasted, never mind baked, apple muffins before and I never could have predicted they would be so delicious! I also used a chopper thing to chop the apples into very tiny pieces, because my husband doesn’t like chunky food, and you never would have known there were little pieces in it, but you could definitely still taste the apple flavor. These were sooooo good! It was a first one for me in baking something with whole wheat flour and I really liked it!!! Even my friend D. who can’t even consider a baked good without chocolate, liked them! I got 12, I suppose slightly bigger than yours, and baked them in two batches in a convection oven, 10 minutes at 210°C and then 10 minutes reducing temperature at 180°C. My apartment smelt heavenly… They kept very well for several days and they’re definitely getting a “round 2” this autumn!!! Made these this morning. Yum! True story: this morning my boyfriend said, “Oh no!!! I didn’t realize I was supposed to bring something to this breakfast!! I have to leave in TWENTY MINUTES!” Without a word, I preheated the oven and pulled up this recipe. He helped me chop apples and we managed to pulled it off. I was just happy that he wouldn’t have to show up empty handed, but I just tried one and they are amazing! Saved the day. Thanks! I am so glad I googled “apple muffins” a couple of weeks ago. These are the best! I didn’t have buttermilk so used plain greek yogurt. I added about a 1/2 cup of toasted walnuts and about a 1/2 cup of shredded cheddar cheese. OMG – wonderful! Hi Deb! Question about greasing the muffin cups – your pictures show you used paper liners. Are you greasing the tin before you put the liners in? Or does that instruction apply only if you skip liners and bake the batter directly in the tin? I’ve never seen directions to grease and line unless you’re greasing the liners (?!?) and then I’m really out of my league! Thanks and keep up the GREAT work! Sorry for the confusion. You use paper liners OR grease the cups. No need to do both. Any suggestions for adjusting the cooking time if I’m making mini-muffins? Thanks. Delicious and easy to make! I just made these today in the wacky Tuscan villa that I live in. All of them were gobbled up instantly, with pleas to make them again for desert tonight! Thanks! I just made these this afternoon. These are so tasty — super moist and just the right degree of sweetness. I agree that the sprinkled brown sugar on top makes it even more amazing. I ended up having too much dry ingredients, though. Maybe about 1/3 cup leftover. This could be a consequence of the above substitutions. Frankly, I was skeptical in the beginning, but these turned out very moist and delicious. I just made these and they are delicious! I got 13 large muffins. For the last one, I just put it in a ramekin. Lovely recipe. I needed to make a nice breakfast pastry for a recruitment event at the university I work for, and I realized too late to buy different ingredients that I couldn’t find the apple bread recipe I had planned to make. Then I thought, Deb will have my back! And lo, you did. :D These are great- not too sweet, and with the fruit and whole wheat I can claim that they’re healthy. I will actually say that I made them the night before and liked them much more the next morning than I did fresh out of the oven. These are very good and smell amazing coming out of the oven. I used nonfat Greek yogurt instead of the buttermilk and they turned out well (though probably not as rich as they would have with full-fat yogurt or buttermilk). I made these last week and they were amazing! I used whole yogurt bc I didn’t have anything else and they were still great! I was a little concerned bc the batter was so thick, but they tasted amazing – and my kids loved them. I came back to write the recipe down for round 2! I used one apple and added a half cup pf chopped walnuts and 1/3 cup halved dried cherries. Also I used 1/3 cup granulated sugar, 1/3 cup brown sugar, and 1/3 cup agave. Muffins are seriously the bomb! Thanks for such a great recipe! Re. a streusel topping: YES, ADD ONE! I mixed together 1/4 cup light brown sugar, 1 tb flour, and 2-3 tb oats, mixed that into 1.5 tb melted butter and sprinkled it on the (very full!) muffin batter before baking. Didn’t want to burn the topping, so I baked at 375 degrees and the muffins were perfect in 22 mins. Used soured milk (whole milk + 1 tb lemon juice) for buttermilk, white whole wheat flour for whole wheat, reduced cinnamon to 1 ts, grated 1 apple and chopped the other. For sweetener: 1/4 cup honey, 1/4 cup maple syrup, 1/4 cup light brown sugar, 1 ts vanilla. For fat: 1/4 cup butter, 1/4 cup coconut oil. Just made these today and YUM! I can’t have dairy so I substituted earth balance for butter and soy yogurt for the buttermilk/yogurt and they were SO good! Definitely will make these again! oh my,this is, by far the best dang muffin recipe I have ever tried! You rock& thanks for sharing this recipe. My kids devoured them and are begging for me to bake more. I reduced flour by 1/2 cup and added 1/2 cup ground flax seed. This ones a keeper,Thanks again! Excellent! Made them vegan with rice milk and a flax egg and they turned out great! i made these today and substituted buckwheat flour for whole wheat. turned out wonderful. thanks for the recipes – love your site. This is a great recipe, it survived all my arbitrary substitutions and still came out delicious. We had no buttermilk so I used yogurt, and my Beloved pouted at the suggestion of apples, so left out the cinnamon, added a teaspoon of vanilla to the wet ingredients, then put in a cup of frozen mixed berries (raspberries, blueberries and boysenberries). They also freeze beautifully. I just bastardized this recipe almost to the point of unrecognizableness for my dairy-allergic son–used coconut oil instead of butter, 1.5 cup flour and .5 cup almond meal (we had no whole wheat), almond milk and a tablespoon of apple cider vinegar instead of buttermilk, and skipped the brown sugar topping–and it came out wonderfully. These muffins are so so good! I’ve made a half batch twice this week. They make a great dessert with a little bit of ice cream. I don’t know how to grease and flour muffin cups so I’ve been spraying pam into them but it’s been overcooking the bottoms. I think I’ll try doing nothing to the muffin cups next time I make them. These are great if you are on weigh watchers, and you don’t even have to skip the topping! I subbed out half the butter for applesauce and next time I’m going to try subbing out even more butter for applesauce. I made these after seeing this recipe tonight. I used pure cane sugar instead of white and also used cane sugar for the topping. So delicious!! Nice and moist too! Thank you for sharing this recipe! To Caitlin, try paper muffin cups, then you don’t have to use cooking spray or butter. They came out great, without breaking at all! These are great, even when your 8 year old takes charge and puts sprinkles on the top ;-) Thanks! Just had to say, these were absolutely delicious!! I am making a second batch right now because the first one didn’t last long! Tried this last week after bringing home waaaaaay too many apples from a PYO farm and loooove it!!! My husband and I are spice freaks, so I added 1 tsp ground clove and 1/2 tsp ground ginger, then tossed 1/2 cup chopped apples in cinnamon and brown sugar to sprinkle on top instead of just brown sugar. I was deeply satisfied with these sweet and spicy oh so good muffins! I got 22 muffins, all of which were finished within 24 hours- don’t worry I shared the muffin love with some friends and family! I just made these and they were SO good! I used half the amount of butter and half the amount of sugar and they were still great (I prefer muffins to be more of a healthy snack than a dessert). I grease muffin cups with coconut oil and don’t use flour and that worked fine. Happy Apple Season! I had a whack of sad apples on my counter, so last night I made a double batch of this. Instead of muffins, I split it between two square-ish pans (ikea, hence the -ish) and topped with your strusel from the Bug Crumb Coffee Cake. With the crumb topping I was afraid of the high temp, so I baked at 350 for a small eternity (45-50 minutes). Hi Margot — It definitely works (not sure if they’ve changed theirs) and I haven’t gotten any reports of burning. However, if you’re nervous, no reason you cannot dial down the temperature and bake them a couple extra minutes. I baked these muffins in large tins using all whole wheat flour, pineapple Greek yogurt, and 1/4 cup white sugar. Oh goodness! They were absolutely fall-apart-crumbly-fluffy-magical-morsels of heaven! Wonderful blog. Made these last night (with olive oil instead of butter), and they were oh so delicious! This will be one of my new breakfast foods. I’d like to make them jumbo sized next time… is it same temperature and cook time for jumbo muffins? I just tasted the first one of these out of the oven, and they are delicious! I used jumbo muffin tins, and got 9 large muffins (filling each with one large muffin scoopfull of batter). I subbed 2oz of the butter with about 1.5oz of oil (so I used a 1/2 stick of butter + about 4 Tbs of oil), to add a little moisture. I also added 1oz of ground flax seed and 1oz of wheat germ, to replace 2oz of the white flour. I mixed some chopped pecans into the batter, and sprinkled some on top with the brown sugar as well (1/2 cup total). I used 2.5 small organic apples. I baked these at 375 for 17 minutes. The house really smells like Autumn too! Great recipe. Heck yeah, thanks for the recipe, deb! I just made these (yes, nearing midnight) and they are awesome. I have to stop myself from eating another one. Super moist. I added some ground flax seeds for my toddler’s sake, but otherwise didn’t change a thing. Yum! I made these tonight and I used half brown sugar and half pure maple syrup. I also replaced some of the milk with applesauce that I had in my fridge.. Delicious! For other parents of little ones….I have two preschoolers and was responsible for snack at both schools in the same October week. I quadrupled the recipe in a single batch and got 48 plus-sized mini-muffins. I overfilled the cups and they domed right up. I probably could have filled them less and gotten another half a pan too. Also, because I was doing batches, I didn’t want to mess with oven temps up and down, so split the difference and baked them at 425. No burning and they came out perfectly. Thanks, Deb! I found this recipe last night and made the muffins this morning. Beautiful! I made the following changes: 11/2 cup whole wheat flour and 1/2 cup ground oats, 3/4 cup sugar, 1 cup 2% milk, 1 cup grated apples, 1 cup grated carrots and 1/4 cup raisins. Again, Beautiful. I recently lost 26lbs over a period of 5 months and have another 42lbs to lose. These muffins at 174 cals and 5.2g fat will be and excellent addition to my weight loss effects and will satisfy my sweet tooth. Merci! I’ve just made these with a few little adjustments to work with what I had to hand and they are amazing! I used two bananas and a 1/2 cup of Greek yoghurt in place of the 1 cup of yoghurt, 1/2 cups of plain flour and 1/2 cup LSA in place of while wheat and plain flour and added blueberries because I had them and they needed using. Thank you so much for this gorgeous recipe, I’ll definitely be using this again. Just made these, I’m in heaven. I made these for the first time this morning and they were absolutely delicious!!! My children and I were in heaven eating them warm out of the oven. This is a recipe I’ll make again and again. Thank you so much for sharing it! I just made these with yogurt and they are sooo good! I’ve made these before and was very impressed, but today I shook it up a bit and made them with bosc pears and pieces of preserved stem ginger. WOW. Great stuff – thanks for the idea! Another variation which turned out pretty tasty – Fruits (two peaches and half a banana to approximate volume of “two large apples”), fat free milk with a tablespoon of vinegar from your tips section instead of buttermilk, white sugar and molasses from your tips section again instead of brown sugar, and instead of one tablespoon cinmamon, I used two teaspoons cinnamon and one teaspoon nutmeg. Oh and using a stick of salted butter didn’t seem to make much of a difference. As always, superbly moist and light. These are such a classic staple. I’m often tempted to add nuts for crunch, but I couldn’t bear interrupting the soft, chewy, comforting muffin at hand. Delicious! Added 1/2 cup of walnuts the second time I baked them- yum! These are delicious! And you are right about the brown sugar on top. I made them and brought them to work and they were a big hit. I like the recommendations by other bakers: pears, ginger, nuts. These are a great basic muffins and lend themselves to a multitude of variations. These are fantastic made them several times now and love them every time. The first picture looks like it has green apples, but you show red in the next. Do the muffins work better with the sour green apple chunks, or the sweet red delicious apples? I made these today using light brown sugar and Granny Smith apples that I had on hand and they came out wonderful! My daughter and her friends devoured them! New fav muffin in my house! These bounce back beautifully after freezing. I put four in the freezer weeks ago, got them out last night and popped them in the oven for 15 minutes this morning. They were like just-baked! What a revelation. Thanks Nica, I followed your recipe and they were amazing. With the final product only have 3/4 cup sugar I think I may be able to cut it a little more. Great blend of coconut oil and butter cut the animal fat some yet keep the richness. Really an great recipe. I made these for Easter brunch and I highly recommend them! I used plain, fat free, regular yogurt and that worked really well (it’s not as thick as the Greek yogurt some people were having problems with). I don’t know what happened when I made these. I followed the directions, turning down the oven after 10 minutes. I even rotated the pans so there were no hot spots and checked my oven thermometer to be sure my temp was right. Regardless, these burnt like crazy. Well, the bottoms did. The tops and middles are delicious though. Too bad I have to cut off the bottom 1/4 inch on all of them. I’ll try them again at a lower temperature. These were amazing and I hate you a little for that. I’m going to make more right now. Serioulsy, this is my favorite muffin recipe of all time. I keep returning to it…I hope I never ever lose it. I just had to let you know that this has been my go-to muffin recipe since I found it maybe a year and a half ago. It is always moist and amazing. I’m a total fruit/bready goods addict, and these always fit the bill. I’ve tried them with all kinds of apples, this morning I’m using some nice, tart Granny Smiths, which I think is my favorite to balance out the sweet batter. I’ve been experimenting with more spices, and every experiment has turned out fantastically! I usually put a bit of extra cinnamon, a bunch of nutmeg and a little ginger and cardamom. I once tried them with a lot of ginger, and that was also delicious! My new discovery from making these at my in-laws over the holidays was ground cloves. That’s not a spice I’ve used very much before, but it made the muffins even more delicious. Anyway, just wanted to thank you for having such a great go-to recipe! Came out nice in the end but had to add milk as mixture was way too dense despite following recipe to the letter. Is this because of the whole meal flour? Just made these muffins today – they were AMAZING! Thanks for the recipe! I made these today and they were awesome!! I accidentally forgot to add the salt but they still turned out yummy! I’d definitely make these again! Thanks for the recipe! I work at a homeless youth shelter, and sometimes make breakfast on weekend mornings. Too many times, I’ve spent part of the wee hours of my overnight shift dreaming up a plan to make one of your recipes, only to realize we’re a few ingredients short. On a recent sunday, however, my clicking was happily not for naught when I landed on these! (I had to sub maple syrup for the white sugar, but found it a pretty tasty alternative; I worried it’d make the batter too wet but they were dense but balanced.) I’ve gotta say, I’ve never, ever seen a baked good go faster here; every last one flew off the tray and “MMMM!”s abounded. From me and a bunch of Seattle youth who faced a chilly morning with happy tums: thank you! Thank you very much for posting this recipe! I am an amateur baker who had never baked successfully, and I was able to make this muffin successfully. You have no idea what this means to me…yay! I just baked these and of course already ate one as soon as the oven dinged! Delicious!!!! Does anybody know the nutritional breakdown, weight watcher and need fat, fiber,protein and carb numbers? I used four small apples (or apples from our CSA which I assume would be considered small by grocery store standards). I ended up with 28 standard sized muffins, but they were on the small side (not overflowing out of the tin). They were like donuts with the brown sugar. I was worried that since they were smaller that they’d burn and the sugar looked like it had burned, but they still tasted great. I couldn’t stop eating them and then felt kind of sick/full, but then ended up eating more later that same evening. Made these last night, and they were delicious! I didn’t have buttermilk, so I used yogurt, but it was thick Greek yogurt, and the batter was too dry. Added 1 cup of milk, and they came out just fine. Yielded 14. Some of the brown sugar bubbled onto the pan and burned a bit, probably because I overfilled the tins (hence the 14 muffins instead of 18). Brought them to work today, and my coworkers happily gobbled them up–a good way to start the week. Thanks for the great recipe! Hi Deb! Love you blog so much and am such an admirer. I made your muffins mini! Here’s a link to my post. Thank you so much for the recipe and continuous inspiration! I love this recipe and it turned out great for me. Would it be possible to add bran to this? I’m a novice baker, so I’m not sure how much to add, or if I need to adjust any of the other measurements. Thanks for your help! You could probably add 2 tablespoons bran and remove 1 tablespoon flour. Hi Deb! A couple of years ago I made these muffins for a man I had briefly dated and then broken up with. The muffins were my plan B if the “let’s try this again” conversation wasn’t sufficiently convincing. Well– he loved the muffins, we got back together (wedding in July!) and we now refer to these whole wheat apple muffins as “love muffins”. Aw. :) I made a batch for Valentine’s Day and thought I’d let you know and say thanks! Love your blog and recipes and the power of the love muffins! Hi Deb! This muffin is on fairly regular rotation. It always keeps moist for several days and actually freezes well. I’ve always used your tips for buttermilk substitute (1 cup milk + 1 tbsp vinegar) and brown sugar (white sugar + molasses). Even using milk ranging from skim to 2% (whatever I have on hand), it always comes out wonderfully. Fruit-wise, just apple is classic but I’ve also used really ripe bananas or even a mix of an apple and a banana, all turning out well. Made these this afternoon and they were perfectly delicious! It was the first time I have had to cream butter and sugar, and the butter wasn’t quite soft enough but the muffins turned out splendid. I was also a bit worried because the batter was so thick, but it didn’t seem to be a problem. Wonderfully tasty! I have never had great success with muffins but these turned out delicious(ly?) – moist and tender and not over-sweet. Easy to make with a 3yr old…only had 2 smallish apples so added sultanas which I soaked in some juice. And I used yoghurt. Mr 3’s reaction: ‘Yum!’ Will play around with less sugar and butter next time since others have had success. But definitely worth it as is. Thanks smitten kitchen! I enjoyed making this recipe and used lactose free vanilla yogurt instead of buttermilk and it turned out very well. I added in dried cranberries for some extra sweet flavor. Made these with peaches, no sugar and using only whole-wheat flour — they were a hit with people who don’t like sweet muffins. However, I’m finding that these stayed great for three days but on the fourth they taste off, so I’m tossing them. Does butter make muffins go off earlier than if I had used vegetable oil? Or is the all the yogurt in these? These are delicious! I love how apple-y they are. I replaced the brown sugar with muscovado sugar and reduced the white sugar, but they were still a little too sweet for breakfast, so I’ll reduce the sugar even more. I bet some chopped walnuts on top would be great too! I’m scared to use a TB of cinnamon. But Deb says it’s okay, so here I go. Just rocked these out with my three year old. So easy and yummy. Thank you. I made these last weekend, and my husband said these were the best muffins I ever made. Well, of course, now I want to go and change it up! Thinking of adding a bit of pumpkin?? Thinking a half cup and reducing the buttermilk to a half cup. Think that would work? I made this into a loaf last night and made a few modifications. I subbed coconut oil for the butter and I used oat flour since I was out of whole wheat. I also added a bit of applesauce because the batter seemed a little dry to me (I used Greek yogurt and see that people point to that as the culprit). I also added a bit of cardamom, cloves and ground ginger to gild the lily. I have to say that this is DELICIOUS and SO MOIST, but I definitely do feel that it is too sweet for a breakfast type of meal to give my 1 year old daughter. I will keep modifying this and would likely add walnuts and take out some of the sugar. I may even sub more of the oil for applesauce. This is a keeper!! I just made these with 100% whole wheat flour, 1/3c vegetable oil subbed for the butter, 1/3c each white and dark brown sugars. Baked for 18min. Plenty sweet enough and absolutely delicious. I just made these and did not peal the apples…..I thought that would make them even healthier and they are delicious. How do you store these best? Refrigeration necessary? Thanks for sharing. These were great! Planning to freeze to have on hand for my kiddo for breakfasts. Perfect recipe. If you use Penzey’s cinnamons reduce to about 1/2-3/4 tbs unless you like them spicy! These look great but are there not 8oz in 1 cup? 8 fluid ounces in 1 cup. (That’s the buttermilk measurement.) The flours are listed in weight ounces. P.S. Our American weight/volume system is terrible and confusing, i.e. that there are fluid ounces and weight ounces and that they’re not the same. I just made a batch of these to use up some leftover granny smith apples, they are REALLY good. I’m always leary of whole wheat recipes because I usually have to alter them to make them moist enough, but I made these exactly as written (I used the buttermilk option), and they are perfect. Thanks for the recipe! Added 1 tsp ground cardamom, 1/4 tsp. ground coriander, and a pinch of cloves. They turned out lovely, the extra spices gave the muffins a little Indian twist that we really loved. Thanks for the wonderful recipes as always, Deb. Deb I am writing to share that I made these for the 4th time in less than a month! I’ve been making half a recipe. They are super perfect – not too sweet, very flavorful, and super moist. Love the brown sugar on the top (though I do admit to using barely a teaspoon for all 6 muffins – we are trying to keep sugar low where we can). I have been using 365 brand white flour because I didn’t really want to go buy whole wheat just for this. Comes out perfect every time! Thanks for another stellar recipe!!! Count me in on the ‘made these twice in two days’ people. Just fantastic, as good as any pro baker anywhere. Easy, and a straight 10, A++. These muffins turned out great – if you use a whole muffin scoop to fill the cups it works out perfectly to 18 muffins. I used granny smith apples and used every bit of the brown sugar for the topping – I will be making this recipe again!!! I made these a few weeks ago and thought they were the perfect muffin, so decided to experiment with how I could use the same muffin base while also sneak some veggies in for my picky toddler. So, I followed the same recipe (used plain Greek yogurt instead of buttermilk), subbed a TON of shredded carrot and zucchini in for the apples, omitted the extra brown sugar on top, and they are JUST as moist and delicious! And my little guy gobbled them up! Just made these- excellent! For anyone wondering, you can halve the recipe, using 1.5 tablespoons of beaten egg (as Deb suggests here: https://smittenkitchen.com/tips/2009/08/20/measuring-partial-eggs/), with great results. These were quick and delicious. I added some orange zest and used greek yogurt thinned with a splash of apple juice. These have a lovely buttery apple flavor. Delicious! Your recipes never disappoint! I made a gluten-free version of this recipe today using Cup4Cup flour and they turned out great. Definitely going to make this recipe again! In the middle of making the batter, I realized that I was completely out of buttermilk AND yogurt (yes, I know). So I used what I had–pumpkin spice kefir. I cut the sugar a little bit. I also added some raisins since I only had two small apples, and some chopped almonds for the heck of it. They are absolutely delicious. Can you substitute sour cream for the yogurt/buttermilk? This is one of my favorite breakfast muffin recipes! Last night I made this into a coffee cake (9 x 13), and it worked out great. I followed basically the same cooking times and temperatures – 10 minutes at 450, and then about 12 more minutes at 400. I love that this recipe works for both muffins and a coffee cake! These were fantastic! I made a bunch of tweaks – halved the recipe, white whole wheat flour, 2% greek yogurt, didn’t peel the apples, cut both sugars by 1/6, a dash of nutmeg. The result was just a tad sweet, crisp from the topping, and moist inside. The apples still had a pleasant bit of chew. Would definitely make again. Since I bought demarara sugar for another of your perfect recipes, I’m wondering if it might not be a good alternative to the brown sugar topping. Guess I’ll have to make two batches and compare, huh? Because all the apples. Hi. I followed the recipe to a T but I ended up burning the sh$t out of the muffins. I don’t think my oven runs particularly hot (it’s fairly new) as I haven’t really burned anything to this degree ever before. Any tips? I noticed the oven temp to be much higher than normal for baking, is this because of the whole wheat flour? You turned it down to 400 after 10 minutes? I know others have missed this too (I should really put it in bold) so I just wanted to make sure. 400 isn’t crazy high for muffins, often just gives them better color. It shouldn’t have burned at 15 minutes, though. Did anything else seem off? Happy to help. Made these last night and they turned out great! I didn’t have yogurt, but had creme fraiche, so used that instead – very yummy. Thanks for a great recipe! Made these for breakfast this morning and they were lovely, moist and heavily fruited. I added some grated nutmeg and ground ginger, too. I may try them with oil instead of butter next time since I never remember to soften my butter in advance (today I melted it rather than exercise some patience and all was well). Ever since I ate a smittenkitchen cupcake at a potluck party, I wanted to try a recipe, too. So this is my first baking recipe from yours and I am very satisfied with the outcome. Sweet, crunchy and fruity with a fluffy texture, these muffins are very presentable to my guests and myself. I also do like the simple preparation. Thank you for posting this nice recipe! Super delicious – even made a sub for half the butter & the texture was still beautifully cake-like inside and crisped on the outer. Instead of 1/2 c. butter, I did 1/4 c. (or half stick) butter + 1/4 c. pureed sweet potato. I’ve made these muffins at least 10 times over the past two years. They are THE best! Today, I have no apples and will be experimenting with frozen blueberries from out garden! Too bad, because I really liked some of them that I had a nerves to convert. It’s not terribly hard to convert US measurements into metric. Why would you need a nerve to convert them? I have made these many many times now and I often use this recipe as a base plan to play off of, depending on what fruit and whimsy seem best. Thanks Deb, for continuing to inspire me as a baker and cook. Swapped the whole wheat flour for rye and added a splash of milk to make it a little less sticky (used yogurt) — amazing! Ann, the RVer posting again. These are a staple in our house. I make them using some of the substitutions as noted above (applesauce instead of butter and less sugar). I use a pan that has 6 muffin cups and adjust cooking time. Delicious! i HATE when people comment ‘ooh, i made this! except i changed everything about this recipe and it was great!’ so i’m just saying, i’m not writing this comment to tell you about my tweaks, but instead to say: y’all, this recipe is foolproof, even when tipsy-baking on a friday night. AND, delicious to boot! i highly recommend the accidental substitution of wheat bran and the addition of molasses leftover from holiday baking. genius as always, deb! Here’s a tip for when your brown sugar is hard: Put it in a small bowl, covered with a moist paper towel and plate and microwave in 30 sec bursts. Works like a charm! thanks morgan! good tip – my mom told me to put a crust of bread in the container and leave it for 24 hours. ain’t nobody got time for that. Annie you are hilarious– your original comment detailing the muffin making experience and your response to your mom about the 24-hr-bread-in-the-brown-sugar container. This could be THE BEST comment I’ve ever read to a recipe! I’m glad I’m not the only one who has these dilemmas. And I agree with Morgan’s tip on the brown sugar, it is what I had to do to make mine. I also added some Flax powder to up the fiber content. My kids (19 months and 5 years) loved these things! I made these once before and found them a tad bland. Spiced up the flavor 2nd time around with vanilla extract, molasses, ground ginger and nutmeg. Also made them into mini muffins (yield: 50) and baked for 7min @ 450 then 3min @ 400. My little boy gobbled them up with peanut butter (because protein and fat). Does the Whole wheat Apple Muffins recipe freeze well? I just made these to use up some soft apples that have been sitting in my garage all winter. The buttermilk did seem to curdle the butter/sugar mixture but once I added the flour it seemed fine. I made muffins in my Demarle silicone pan and they popped out with ease! Topped with crunchy turbinado sugar, these were delicious! I think I will make these as a bundt coffee cake for brunch tomorrow. Thanks! Tried making this on a rainy day. Subbed 3/4 cups of greek yogurt for the yogurt/buttermilk, but found the mixture way too thick so added some (~1/2 cup) skim milk to thin it down. Still quite thick. Opted for a bread pan instead of the cupcake pan (hate cleaning these things). Turned out not good — apples sunk to bottom, crust was overbaked, crumb was underbaked (even after an hour). Probably my fault with all the substitutions though. have you tried adding cheddar to apple muffins (skip the topping, i think) ? you might want to. the recipe i have == total family favourite. knowing how great your recipes are, i will be trying your recipe with grated cheddar added. I made these. I loved them. The smell alone was worth making them. I did make a couple of changes. We’re getting old so I substituted canola oil for the butter to make them more heart healthy and easier. I didn’t read carefully enough and put all the brown sugar in, didn’t matter still excellent. I increased the whole wheat flour to 1 ½, decreasing the white flour. Since I like them fresh in the morning, I regularly measure all dry ingredients and all wet ingredients separately the night before. The next morning I just mix the 2. This was another reason to use oil. I did wait and chop the apples the next morning but did not peel them. Leftover muffins are frozen and microwaved as needed. Would sour cream work? Or should I get some yogurt? We rarely eat yogurt anymore but if you think it would work better, I can absolutely get some. This calls for buttermilk or yogurt, but I only have full fat sour cream in the house, will that work? Just made these and YUM! They are perfect. I threw a dash of nutmeg into the brown sugar sprinkled on top, and also added 1/4 cup of chopped hazelnuts for a little extra crunch. Great recipe. So I accidentally bought vanilla yogurt- can I sub it and lessen sugar? Would you have a guess on amount of sugar? I usually just guess but often end up with something not quite sweet enough. Thanks! I followed the directions and your recipes always turn out for me. Unfortunately, most of mine were burnt on the bottoms. Some had silicone muffin cups, and those were better, but the paper lined ones were ruined. I baked these today and they were delicious! Except that the bottoms were burnt within the first 10 minutes of baking. Is the temp listed (450 deg F) correct? I made this today but used a loaf pan. The batter was extremely thick so I was a little concerned but the result was delicious. I will absolutely make it again. The recipe says 2 large apples, but there are three pictured– does either work? It’s kind of a silly question, but my brain is stuck. Also, greasing and flouring muffin papers– is missing this step perhaps how some people’s muffin bottom’s are getting burnt? I’ve never greased and floured muffin papers before and it seems very cumbersome in my mind. Any tips? Or just go for it? Use two. I think I grabbed three before reading the recipe correctly. Made these for breakfast today. I accidentally mixed the egg and buttermilk together before adding into the creamed butter — it was a little lumpy at first, but turned out fine. I heaped mini-muffin tins with batter. The minis took 17-18 minutes. They were so light and fluffy, and just sweet enough. These were a big hit and a great way to use the dregs of our orchard apples. Just bought a muffin tray and am planing to give this recipe a try this weekend (never made muffins before). I will be using spelt flour (mixing whole and white. Can I replace the butter with olive oil (trying to make it healthier)? Or is that a really bad idea? One of my coworkers is celebrating a birthday today and when I asked what I could bake she said “I like crumb cake and apple things.” As I always do on such occasions, I started on smitten kitchen, and found these. Other commenters have mentioned wanting to add a crumb topping, and of course you had the answer for me in your rhubarb streusel muffins (https://smittenkitchen.com/2011/05/rhubarb-streusel-muffins/) and I think I made the new perfect breakfast treat. Hope others will try this great combo! Thanks – as always – Deb for making all special occasions more delicious. i made these using unsweetened coconut milk and coconut sugar instead of granulated. they were phenomenal! I would go for 2x the apple but that is personal preference. I also replaced the white flour with almond flour. They simply needed to cook for ~5 minutes longer. Here’s an idea for leftover charoset. My version is apples, cinnamon, nutmeg, ginger, cardoman, wine, oranges, and nuts. There are always leftovers. 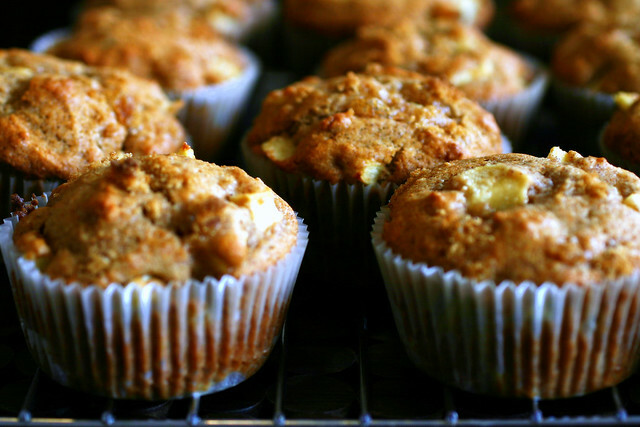 Instead of chopped apples, use that for muffins! It would be perfect, and very handy. Just made this last night and I was really happy with the results. I added just a splash of milk before folding in the apples because the batter seemed really thick and I chopped the apples into small pieces, instead of a coarse chop, based on my preference and the hope that it would make my toddler more likely to like the texture. Love the flavor (as does my husband), still working on getting my toddler to eat it! Hello, Deb! 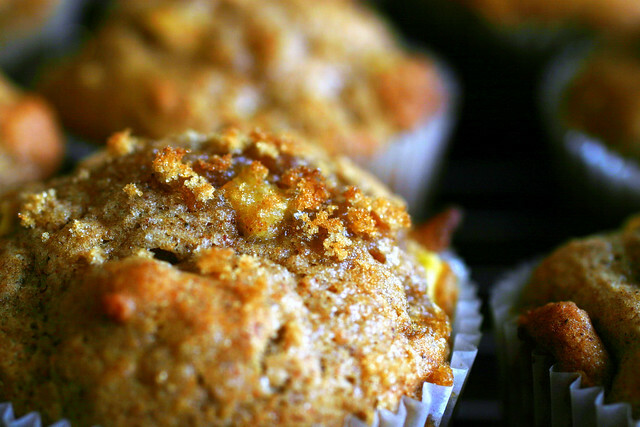 We love these apple muffins. I find them to be light and yummy even after freezing. I’ve made them at least 5 times. Every time the buttermilk curdles the batter no matter what stirring I do..lowest speed on mixer didn’t do. Wire whisk, still curdled. Wooden spoon and rubber spatula didn’t resolve the issue even though I thought I was stirring gently. Can you help? They are still good. But I wonder how much better they’d be if I got that step right. Thanks! I made these in mini-tin size. Just oiled, not floured the pan. Did 4 minutes at 450 followed by 5 minutes at 400 and turned our perfect. I suspect one could reduce the sugar … they are nicely sweet. I love this recipe because it’s easy and i always have all the ingredients on hand. i used the honey crisp apples from Trader Joe’s which aren’t too sweet but lightly tart and so delightful for these muffins. Today was a perfect morning for them: light rain and overcast skies here in the phoenix valley of the sun. I made these this morning and they were delicious. I had plain Greek yogurt and used a cup of that and found that it made the batter a bit stiff so I thinned it with a little milk. This recipe yielded 12 muffins for me – and I’m regretting that I’d planned to give six of them away! I will make it again. I have made these twice and find them to be FANTASTIC– not too many ingredients, and a delicious finished product. However, some of the tops burned where the brown sugar was sprinkled– not on every muffin, but at least half. I lowered the rack to the middle for the second bake and the result was the same. Should I move them to just below the middle rack for baking, or might this just be my oven’s poor quality? I baked these today with some Golden Delicious apples and they turned out AMAZING!!! My whole family loved them, even the kiddos. Soooo moist, just perfect! “the best muffins have more fruit inside than seems, well, seemly.” This meant about 1 pound of golden delicious apples and a half cup of dried cranberries. “and if you brown that butter first, you might have trouble getting [people] to leave.” I store butter in the freezer and am too impatient to wait for it to come to room temperature. I melted and browned it. Yum. The 1/4 cup of brown sugar was stirred into the browned butter and allowed to cool slightly, then mixed in with the sugar/apple/egg stuff and the yogurt was mixed in too. For the topping, I referred to the breakfast crisp and melted 2 tablespoons of butter, added the other 1/4 cup of brown sugar, 1 tablespoon of flour, and 1/3 cup of rolled oats. I made these with Apple cider that had started to ferment in lieu of the milk… Excellent substitution! They were so appley and tangy and moist and delicious! I made these exactly as written (Don’t forget to turn down the oven after 10 minutes!) and they came out perfectly. They were a huge it a a church brunch and everyone wanted the recipe. I do have one question though. How do you efficiently flour a muffin pan? I found this to be a real pain in the neck! I agree — it’s a total pain. I have a flour shaker I use for counters when I’m rolling out doughs. I’ll shake that over and then pat it out over the sink. Or you can use muffin liners! Good morning and congrats for your blog. One tiny question…as my daughter would prefer an apple cream and not small apple bites, is that possible? Does it change sth in the ingredients or in the cooking time due to increases moisture? I’m not sure it will work the same here. You might start with this apple cake instead, which uses applesauce. I made this – sort of. I’m generally a lazy baker, so I did not cream the butter and sugar as instructed. Rather, I mixed the dry ingredients with the sugars in a bowl. I measured out half a cup of oil (not butter) and whisked an egg in it. Added this to the dry ingredients and the buttermilk, measured in the same cup. Mixed everything together and while some dry flour still remain, folded in 4 chopped small apples, unpeeled (told you I’m lazy). Divided into a twelve-muffin pan. Sprinkled raw sugar on top (less than 1/4 c). Baked at 450 degrees for 5 minutes. Lowered the temperature to 400 and baked for another 15 minutes. Voila! One-bowl wonder! One of the best recipes I’ve ever adapted on Smitten.